History is alluring. It teaches us about the culture, people, and traditions of an era gone by. In the history of the southern parts of the country, the Chola Empire ruled for centuries. They gifted a major chunk of history to us to devour on by building some of the most magnificent temples of all times. The Chola Temples were constructed between 11th- and 12th-century. The three temples built by the Chola kingdom are a part of the UNESCO World Heritage Site and are labelled as, "Great Living Chola Temples". These are - The Brihadesvara Temple (Thanjavur), Brihadisvara Temple (Gangaikondacholisvaram) and Airavatesvara Temple (Darasuram). A Hindu temple, dedicated to Shiva is located in Thanjavur, Tamil Nadu, India, Brihadisvara Temple was built between 1003 and 1010 AD by Raja Raja Chola I. It is one of the largest temples in South India located 350 kilometres southwest of the city of Chennai. The place is well connected by bus and train facility. If you want to fly for a quick weekend getaway, then the nearest airport, Tiruchirappalli International Airport is 55 kilometres away. More than 1000 years old, this Chola Temple is the majestic work of the architect Kunjara Mallan Raja Raja Perumthachan. The architecture of the grand temple uses the principles of symmetrical geometry rules. The gigantic temple complex encompasses five sections. The high tower where the sanctum is located is called Sri vimana, in the front of the complex is the Nandi hall or Nandi-mandapam. Between these two structures, the huge gathering hall known as Mahamandapam and the community service hall, Mukhamandapam. There is also a pavilion which is connecting structure between the sanctum and the gathering hall known as Ardhamandapam. The wall of these structures is covered in magnificent carving and paintings which speaks volumes about the skilled artisans at that time. Interesting Fact: This Great Living Chola Temple was a result of a dream that Raja Raja Chola had while visiting Sri Lanka. The temple opens to the public at 6:00 AM and closes around 12:30 PM. After this, the temple gates are closed for a couple of hours, to be next opened at 4:00 PM. Visitors can offer prayer till 8:30 PM when the temple gates are closed for the day. 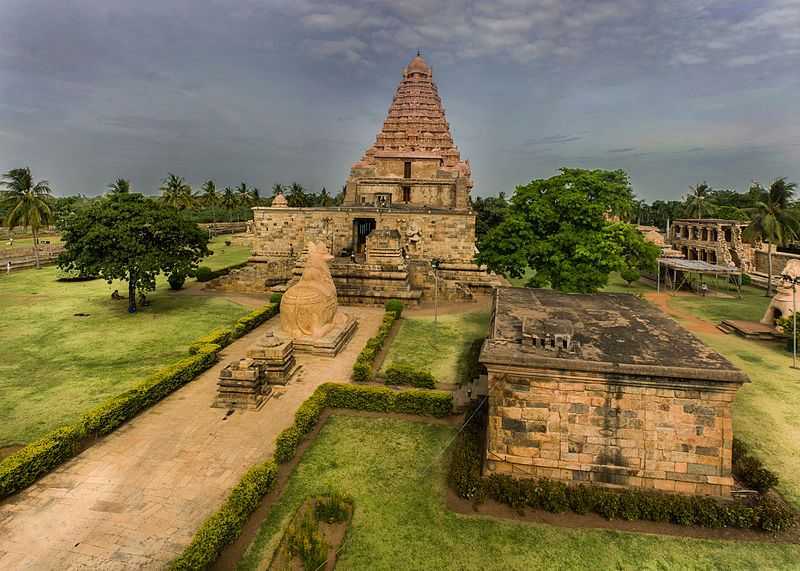 In the calm district of Ariyalur, in Tamil Nadu, another of the Great Living Chola Temples, Gangaikonda Cholapuram (Brihadisvara Temple) is located. Located 280 kilometres away from Chennai, the temple can be easily reached by bus as well as trains. The magnificent temple was constructed by Rajendra Chola I in 1035 AD. After conquering the Ganges in the northern part of the country, he acquired the name Gangaikonda Chola, as the conqueror of the Ganges. He laid the foundation of Gangaikonda Cholapuram and proclaimed it as the capital of his kingdom. It served as the capital city for a span of 250 years. Although the main deity in the temple is Shiva there are also other deities prayed here, such as Durga, Surya and Vishnu, to name a few. The architecture style of the Brihadisvara Temple is a square design plan, depicting the infamous Dravidian style of the architecture. All the structures on this glorious Chola temple grounds are square-shaped. The main courtyard is covered by two square structures that are built next to each other. The primary sanctum, Garbha Griha, the mandapas and the Upapitham are also squarish buildings. The typical craftsmanship of the Chola kingdom in the 11th century is depicted in the bronze statues kept in the temple. The temple opens at 9:00 AM with the morning pooja (Kala Sandhi) and closes with the night pooja (Artha Jamam) at 8:00 PM. A major festival, Annaabishegam, is celebrated once a year and is a great time to visit the historical site. The main deity, Lingam, is beautified with rice from top to bottom. Due to its monumental size, there is a requirement of 75 bags of rice to cover it. Near Kumbakonam, in Tamil Nadu, Airavatesvara Temple is located in Darasuram. Similar to other Chola temples, it is dedicated to Shiva. It was built by Rajaraja Chola II in the 12th century. The striking temple is an architectural marvel with the chariot structure that has intricate carving and sculpting done by talented artisans. The temple is a depiction of a chariot being pulled by a horse and an elephant. The architectural style, square structures in common among all the great living chola temples. There is 212 feet Vimana, a Lingam, a colossal Goddess Periyanayagi statue and a massive Nandhi at the entrance of the temple complex. The paintings and epigraphs detail the history of the Chola dynasty. The impressive carving on the ceiling of Shiva and Parvati seated on the inner side of blooming lotus is a majestic view. The temple opens at 06:30 AM and closes at 08:30 PM for the day.There is no fee for photography with handheld cameras, however, for any videography with specialized types of equipment, one needs to contact the Superintending Archaeologist, A.S.I Chennai Circle. Dress up appropriately keeping in mind the cultural sentiments. Take a tour guide to visit these great living chola temples as they will explain the architectural and religious importance of everything in a lot of detail. The guides speak English and understand Hindi. They can also speak Tamil. The unique architecture of the Great Living Chola Temples leaves tourist spellbound. These are regarded as an evolutionary landmark in the architecture of Southern India.The inscriptions on the walls of the temples are historical narratives, explained graphically. The highly sculpted pillars showcase the design intelligence during the reign of Chola kingdom. These stone carved gems certainly need a visit, if you haven't planned a tour till now. Traditional Dresses Of Tamil Nadu - Dressing Style and Culture!